Below is a guest-post from Sandra González-Bailón at the Oxford Internet Institute and Pablo Barberá at NYU’s Social Media and Political Participation (SMaPP) laboratory. Social networking sites, such as Twitter, Facebook or Tumblr, appear to be playing a prominent role in the coordination of the still ongoing protests in Turkey. There is abundant evidence suggesting that social media have been pivotal in the spread of information, especially in the absence of coverage by traditional media ; to recruit and mobilize protesters ; to coordinate the movement without the infrastructure of formal organizations ; and to draw the attention and support of the international community . That social media is at the heart of these protests was defiantly acknowledged by the Turkish Prime Minister himself when he described them as “the worst menace to society” . There are also reports that 25 people were arrested because of their use of Twitter to spread information about the protest . The protests in Turkey add up to a long list of popular uprisings and massive demonstrations around the globe that took shape and gained momentum with the help of social media. However, there are still many open questions about how social networks facilitate the diffusion of information and whether some users play special roles in increasing the visibility of the protests. Results from a preliminary analysis of data collected at the SMaPP lab tracking protest activity in Twitter reveal patterns that are consistent with previous findings about protests in Spain and the US [7,8,9,10]. First, the distribution of centrality is very hierarchical: 1% of users concentrate about 80% of all retweets received; three quarters of users active in the protests do not receive any retweets at all. The implication of this asymmetry is that a minority of users act as the main sources of information: they are the ‘authorities’, the authors of the messages that resonate through a higher number of users. It also suggests that communication in online networks relies on a division of labor: those who generate valuable content (authorities), and those who facilitate its dissemination (the rest). Second, these authorities tend to have large audiences – or a larger number of followers – but many of them are not particularly central in the Twitter network. Figure 1, which plots activity data for the first five days of the protests, illustrates this. Users that act as the ‘authorities’ in this stream of protest information are located above the dashed red line. 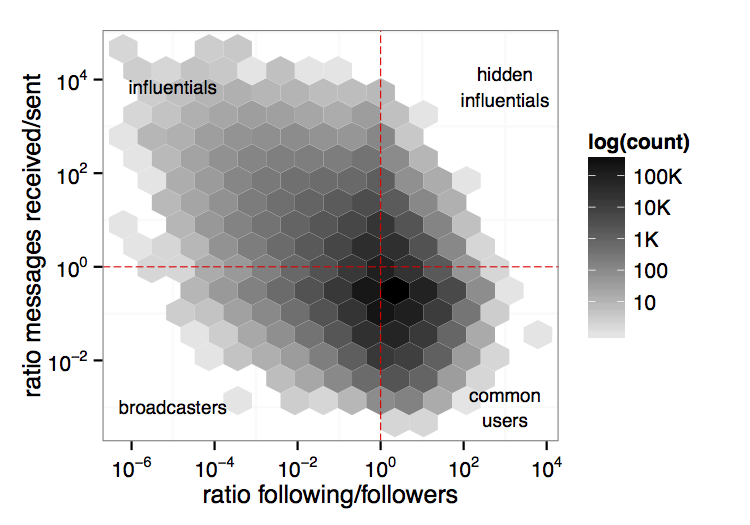 Most of them have a large number of followers, as celebrities or public figures tend to have; but many of these ‘authorities’ (37%) have networks that are quite symmetrical and average in size, or who follow more users than follow them back. We call these users “hidden influentials” because they are not globally visible in the Twitter network, but they are very visible in this stream of protest-related information. They are at the heart of protest communication even though they are not at the heart of the followers network. First, compared to the ‘indignados’ protests in Spain, this network is more hierarchical, with more extreme outliers falling in the category of influentials (they have significantly larger audiences, that is, the potential to directly reach many more people); in particular, the network has many more broadcasters (31% versus the 7% in the Spanish case). Although the majority of people sending messages are still common users, that is, not particularly visible or central (59% fall in this category vs 66% in the Spanish protests), their relative weight is lower, which suggests that the influence of prominent people and public figures, like journalists or celebrities, is greater in the Turkish protests. [Note: this figure only takes into account activity generated during the first five days of the protests, whereas the analysis of the Spanish case tracked activity for the period of one month; this might affect the number of hidden influentials, the visibility of which accumulates over time – some users currently classified as common might upgrade as protests unfold]. Second, the size and composition of the network of retweets shows certain volatility. In this network, a user (A) is connected to another user (B) if A reposts a message previously published by B. There is a lot of variation on who is more central in this authority network over the first few days of the protest. While the protests started as a local, grass-roots mobilization opposing plans to remove Gezi Park, they soon escalated into anti-government demonstrations, and were quickly internationalized, with the “occupy” movement being particularly active after the third day of the protest: by the fourth day, more than 30% of unique users employing protest hashtags were English speakers; Twitter accounts like “YourAnonNews”, “AnonOpsLegion” or “AnonOpsMob”, part of Anonymous, a network of hacktivists, also started to appear among the most retweeted. To conclude, the study of social media can shed interesting light into the dynamics of information diffusion in the organization of collective action. This is particularly the case when social media, as in the Turkish protests, supplies information that is suppressed by traditional media. Evidence suggests that 15K users sent at least one tweet from Gezi Park  which points at the spillover effects of online activity into offline action. More research, however, is needed to identify the mechanisms that drive the self-organization of tens of thousands of people in the form of massive protests, and the features that are generalizable and unique to each particular case. These claims are not implausible, but I found no corroboration for them in the post. We need more than anecdotal material from journalists and tendentious comments from the Turkish prime minister to substantiate the authors’ important assertions. We first need to set parameters for evaluating the authors’ claim that “social media have been pivotal” and “are at the heart of these protests.” I could potentially see four broad types of protest participants: (1) those whose participation was spurred solely by SNS and who would not have participated had it not been for SNS; (2) those whose participation was spurred partly by SNS but was driven at least as much by hearing or reading about the protests through other channels, including online news reports, telephone or face-to-face conversations, and meetings with friends and acquaintances; (3) those who use SNS but were going to take part in the protests anyway; and (4) those who do not use SNS. If, as the authors assert, SNS have been “pivotal” and “are at the heart of these protests,” this would presumably mean that a large percentage of the Turkish protesters fall into category 1 and a very large percentage into categories 1 and 2. It would be interesting to know whether this is the case, but the authors do not address the question. The authors make claims here about “social media” and “social networking sites” but focus solely on Twitter. The latest data I can find indicate that, in Turkey (as in many other countries), Facebook is a considerably more important SNS than Twitter, especially for posting of videos. The data indicate that roughly 17 percent of Turks who regularly use the Internet are Twitter users. An analysis of the content and actual impact of the Turkish-language tweets will be needed to find out what the Twitter patterns highlighted by the authors actually mean. Were these tweets the sole factor inducing a person to take to the streets; were they one of several factors; or did they play no role at all? I was hoping to find something about this in the post, but the authors do not address the matter. I think you are totally right with what you are saying. They really do not provide any evidence on the importance of social media in these protests. If they wanted to prove this they would have to do it in another way, probably they way you or Christian Fuchs suggested. But as I read it, this isn’t even their aim. They just introduce the text by saying social media has been pivotal to give more importance to their work. But after all this is just a detail here. Its called the „The Dynamics of Information Diffusion in the Turkish Protests“ and dynamics seems to be their main interest. Turkey has its authentic social media. Literally called “dictionaries”, there are upto social media formations which are highly interactive within theriselves and became even more politically charged since 2011. This analysis is a typical Western-centric analysis of contemporary protests: some Western scholars analyse tweets, Facebook postings etc and conclude that the protests, revolutions etc were tweeted, facebooked etc. Here the scholars claim that “social media have been pivotal” in Turkey and that “social media is at the heart of these protests”. The point is that evidence about the real role of social media in protests cannot be obtained by analysing social media content, networks, etc. – one needs to interviews and conduct surveys with the street protestors in order to find out what they use, what they do not use etc. Of course Western scholars cannot do this because thet are not there. Isn’t it sufficient to start with Goethe’s “In the beginning was the deed…”bravely contradicting St John’s Gospel with its “In the beginning was the Word..”? and later quoted by both Marx and Lenin? Can’t we argue that the key element in historical events is the actions of the participants? Participants’ communications are, of course, a part of their actions but is anyone arguing they are the most important? It is the communications, as written, recorded, and now in ever greater quantities emailed, tweeted etc. that survive for others to analyse but that is no reason to give them a privileged status.